There is rarely a more nutritionally demanding time during a woman’s life than pregnancy (and later breastfeeding), when your intake of nutrients from foods and supplements are needed not only to keep your body running, but also to nourish and support your rapidly growing baby. Proper nutrition is crucial at all stages of fetal development (and even before conception), and if mom doesn’t eat right, her growing baby won’t either. For a succinct and easy-to-follow overview of the types of foods and nutrients that will support a healthy pregnancy, read my optimized nutrition plan. Ideally, by the time you enter pregnancy, you will already be in the Intermediate or Advanced stage, but even the Beginner stage is far better that the typical American diet. As you’ll see, it is focused on minimizing processed foods while increasing your intake of vegetables, healthy fats, and high-quality sources of protein, all of which are ideal for nurturing a growing fetus. If you’re wondering about specific foods, see below for some of the top superfoods to eat when you’re pregnant. Vitamin D isn’t a food but rather is made by your body in response to sunlight exposure. It’s so important, however, that it deserves to be number one on this list. Raising vitamin D levels among pregnant women is of particular concern, as deficiency affects not only the mother, increasing her risk of complications during pregnancy or delivery, but also has short- and long-term ramifications for her child’s health. I firmly believe optimizing your vitamin D during pregnancy is one of the most important things you can do for the health of your child. When a child is born deficient in vitamin D, his or her health can be significantly affected in any number of ways. Research confirms there is a lifelong impact of vitamin D deficiency in pregnancy ranging from childhood allergies to asthma, colds and flu, dental cavities, diabetes, and even strokes and cardiovascular disease in later life of the child. Further, each year, more than half a million preemies are born, and it’s the number one killer of newborns. It’s also the second leading cause of death among children under the age of five. Research shows that vitamin D could likely prevent half of all these premature births. It can also cut your risk of preeclampsia, gestational diabetes, and prenatal infections by approximately 50 percent. Among African-American and Hispanic populations, approximately 70 to 75 percent of all preterm births could be prevented with vitamin D optimization. Vitamin D screening is key. This is the only way to determine whether you might be deficient or not, and regular testing is important to make sure whatever dosage of vitamin D you’re taking is sufficient to reach clinically relevant levels. GrassrootsHealth, which has a panel of 42 researchers who provide scientific evidence, recommends maintaining a vitamin D blood serum level of 40 to 60 ng/ml to protect your and your baby’s health. However, according to previous studies, your levels need to be above 50 ng/ml to protect your baby from serious complications, such as premature delivery and preeclampsia.1 So please, if you’re pregnant, make sure to get your 25-hydroxy D levels checked. While optimizing your vitamin D through sensible sun exposure is best, if this isn’t possible Dr. Bruce Hollis’ research indicates that 50 percent of women can achieve this level with 4,000 IUs daily during pregnancy and 6,400 IUs (for nursing mothers) of vitamin D3 on a daily basis. Again, you’ll need to have your vitamin D levels tested to be sure you’re within the optimal range. Eggs are a phenomenal source of protein, fat, and other nutrients, including choline and the antioxidants lutein and zeaxanthin. In pregnant women, choline plays an important role helping to prevent certain birth defects, such as spina bifida, and playing a role in brain development. Fish has always been the best source for the animal-based omega-3 fats EPA and DHA, but as levels of pollution have increased you have to be very choosy about which types of seafood you decide to eat – especially when you’re pregnant. If you’re not careful, the toxic effects from the pollutants in the fish will outweigh the benefits of the omega-3 fats. Among the safest in terms of contamination, and the highest in healthy omega-3 fat, is wild-caught Alaskan and sockeye salmon. Neither is allowed to be farmed, and are therefore always wild-caught. The risk of sockeye accumulating high amounts of mercury and other toxins is reduced because of its short life cycle, which is only about three years. Canned salmon labeled “Alaskan salmon” is also a reasonable choice and offers a less expensive alternative to salmon fillets. A general guideline is that the closer to the bottom of the food chain the fish is, the less contamination it will have accumulated, so other safer choices include smaller fish like sardines, anchovies, and herring. Sardines, in particular, are one of the most concentrated sources of omega-3 fats. They also contain a wealth of other nutrients, from vitamin B12 and selenium to protein, calcium, and choline, making them one of the best dietary sources of animal-based omega-3s. You can also supplement your diet with animal-based omega-3s by taking a krill oil supplement. Whole dairy products made from grass-fed raw milk are a rich source of healthy fats, protein, calcium, B vitamins, magnesium, zinc, phosphorus, and more. Grass-fed raw butter, milk, and cheese from high-quality sources are all beneficial. Raw organic milk from grass-fed cows not only contains beneficial bacteria that prime your immune system and can help reduce allergies, it’s also an outstanding source of vitamins (especially vitamin A), zinc, enzymes, and healthy fats. Your absolute best bet when it comes to yogurt is to make your own using a starter culture and raw grass-fed milk, which you combine and leave at room temperature overnight. By the time you wake up in the morning, you will likely have kefir (fermented milk). If it hasn’t obtained the consistency of yogurt, you might want to set it out a bit longer and then store it in the fridge. If you want to sweeten up your homemade yogurt naturally, try adding in some whole berries or dried (unsweetened) coconut. Orange-colored sweet potatoes owe their appearance to the carotenoid beta-carotene. As an antioxidant, beta-carotene can help ward off free radicals that damage cells through oxidation, which can speed up aging and make you vulnerable against chronic diseases. This antioxidant can help support your immune system, as well as lower your risk of heart disease and cancer. It’s also very important during pregnancy, as it’s converted into vitamin A in your body. Vitamin A is essential for fetal health and development, but high levels of animal-based vitamin A may cause toxicity, making beta-carotene an ideal alternative. Sweet potatoes are also an excellent source of fiber, which can help support healthy blood sugar levels and improve digestion. Broccoli and dark green leafy vegetables like spinach and kale are loaded with important nutrients for pregnant women, including folate, fiber, potassium, calcium, iron, and vitamins C, K, and A. Their rich antioxidant content will also support your immune system health and digestion, while their fiber can help prevent constipation, which is a common problem in pregnant women. Grass-fed beef is an excellent source of protein and other nutrients in high demand during pregnancy, like iron, choline, and B vitamins. Chicken is an excellent source of protein, B vitamins, selenium, phosphorus, and choline. It provides all B vitamins along with a surprisingly varied number of additional nutrients. Berries contain concentrated amounts of the disease-fighting phytochemicals found to boost your immunity, prevent cancer, protect your heart, and prevent seasonal allergies. Berries are lower in sugar than many fruits, so they are less likely to destabilize your insulin levels. Berries also contain high amounts of vitamin C, which will help your body absorb iron, and a good amount of fiber. Avocados provide close to 20 essential health-boosting nutrients, including potassium, vitamin E, vitamin K, B vitamins, and folate. They’re also one of few foods that contain significant levels of both vitamins C and E and are an excellent source of healthy monounsaturated fat. Avocados are even high in fiber, with about 4.6 grams in half an avocado. Fiber plays an essential role in your digestive, heart, and skin health, and may improve blood sugar control, and more, so when you eat avocados you’re really providing your body – and your baby – with a comprehensive package of nutrition. A fiber-rich diet is recommended for most adults, but ramping up your fiber intake may be especially beneficial during pregnancy. Researchers from the Department of Immunology at Monash University in Australia revealed that a high-fiber diet may beneficially alter a woman’s gut bacteria during pregnancy, producing anti-inflammatory substances that suppress asthma-related genes in her baby.5,6 Mounting research also suggests that a high-fiber diet can help reduce your risk of premature death from any cause, likely because it helps to reduce your risk of a number of chronic diseases. This includes type 2 diabetes, heart disease, stroke, and cancer. Studies have also linked a high-fiber diet to beneficial reductions in blood pressure, improved insulin sensitivity, and reduced inflammation — all of which can benefit your baby. 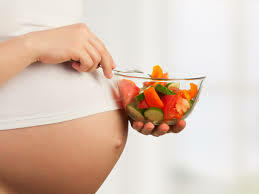 The best way to increase your fiber intake during pregnancy is to focus on eating more vegetables, nuts, and seeds. The following whole foods, for example, contain high levels of both soluble and insoluble fiber. Healthy weight gain is important and expected during pregnancy, but women who are overweight before pregnancy, and those who gain too much weight while pregnant, may be putting their babies at risk of childhood obesity. Researchers followed more than 700 women who returned for follow up with their children were 7 years old. Children of mothers who had been overweight prior to pregnancy were more likely to be overweight. From my perspective, it is simply reprehensible malpractice for a health care professional to fail to address your vitamin D level if you’re pregnant — it’s just that important. For pregnant women, optimizing your vitamin D is even more important for your child’s health and development than folate, which is routinely recommended for pregnant women. Separate research found newborns of mothers whose diets were deficient in vitamins D and E had airway cells that reacted more to irritants and allergens.10 This may, in turn, impact the development of asthma or allergies later in life. Separate research also added to past data linking low vitamin D levels during pregnancy with premature birth. Along with reducing your risk of premature birth, studies have found that vitamin D may protect against a number of birth defects and autism, as well as pregnancy complications like high blood pressure. It is absolutely imperative that pregnant women maintain a blood level of between 50 and 70 ng/ml of 25-hydroxy D, and I am hopeful that in the not too distant future it will be mandatory for pregnant women to receive regular vitamin D blood test levels. “The research… shows that there are regions of the sperm epigenome that are sensitive to life experience and particularly to diet. And that this information is in turn transferred to a so-called epigenomic map that influences development and may also influence metabolism and disease in the offspring in the long term. The epigenome is like a switch, which is affected by environmental cues, and is involved in many diseases including cancer and diabetes. For more detailed healthy pregnancy guidelines, please review my special report: “No-Nonsense Guide to a Naturally Healthy Pregnancy and Baby,” which covers far more than the basic nutrition tips offered here. This entry was posted in Alternative Medicine, Herbs, Home Remedies Series, Lifestyle Health, Longevity, Medical Studies, Nutritional Blends, Tele-Medicine, Telemedicine Reporter, Vitamins - Supplements, Weight Management and tagged avocados, berries, Broccoli and Leafy Greens, Chia Seeds, Dad's Diet Matters, fermented foods, folate consumption, Full-Fat Grass-Fed Dairy, Grass-Fed Beef and Pasture-Raised Chicken, healthy fats, high-quality sources of protein, jicama, minimizing processed foods, National Telemedicine Foundation, NTF, Organic Free-Range Eggs, sardines, sweet potatoes, Telemedicina Mexico, telemedicine, Top Foods to Eat, US Tele-Medicine, vegetables, Vitamin D, When You're Pregnant by Admin. Bookmark the permalink.